Received: July 12, 2018; Revised: November 4, 2018; Accepted: November 5, 2018.; Published online: February 5, 2019. Herein, we report a case of lung transplantation in a patient with profound preoperative hypercapnia, focusing on the cardiopulmonary bypass strategy used for brain perfusion during the operation. We applied the pH-stat method for acid-base regulation, and thereby achieved the desired outcome without any neurologic deficit. We present the case of a 45-year-old woman (height, 153 cm; weight, 32 kg), who underwent bilateral lung transplantation due to bronchiolitis obliterans (BO) related to chronic graft versus host disease following allogeneic peripheral stem cell transplantation for acute myeloid leukemia. Preoperatively, the patient was dependent on noninvasive positive-pressure ventilation with minimal oxygen requirements (2 L/min) at home for over 10 hours a day owing to chronic compensated hypercapnia (partial pressure of carbon dioxide [PaCO2], 80 mm Hg; pH, 7.35 without hypoxemia). BO progressed rapidly despite the administration of tacrolimus and prednisolone, and the patient required frequent care in the intensive care unit owing to pneumonia and altered mentality with hypercapnia (PaCO2 >100 mm Hg). On the day of lung transplantation, the hypercapnia became aggravated, with a PaCO2 of 115 mm Hg, and her pH dropped to 7.18. The application of mechanical ventilation could not adequately correct the PaCO2. Cerebral blood flow (CBF) is primarily controlled by the autoregulation of vascular resistance and is strongly influenced by blood PaCO2 and pH . Since hypercapnia was severe in this patient, maintaining adequate CBF throughout the procedure was an important issue . We applied near-infrared spectroscopy-based cerebral oximetry to the patient, and her cerebral O2 saturation (CRBO2%) was monitored continuously throughout the procedure. We elected to start cardiopulmonary bypass (CPB) early to evaluate CBF status. Immediately after initiation of CPB, the PaCO2 dropped, pH increased, and the CRBO2% decreased abruptly (Fig. 1). We subsequently added carbon dioxide (CO2) gas into the sweep gas line of the oxygenator with a 1 L/min flow rate. We decided to change the target of PaCO2 from 60 to 80 mm Hg because the patient had chronic hypercapnia. With frequent PaCO2 and CRBO2% monitoring, we added CO2 gas when required to achieve the target PaCO2. The total CPB time was 325 minutes and CO2 was delivered intermittently 3 times (at 30, 38, and 212 minutes) with a 60-mL/min or 90-mL/min flow rate until the CO2 level dropped to within target range. Arterial mean blood pressure was maintained at approximately 70 mm Hg to facilitate cerebral perfusion. The CRBO2% increased after CO2 gas supplementation and remained at approximately 55% until CPB weaning and completion of the lung transplant (Fig. 1). Postoperatively, we ensured a low tidal volume of ventilation with permissive hypercapnia to prevent significant PaCO2 changes until the patient recovered spontaneous ventilation. We also took great care to prevent alkalosis until postoperative day 5. Potassium chloride solution was administered adequately to enhance the renal excretion of bicarbonate. Weaning from the mechanical ventilator was successfully achieved without any neurologic or cognitive deficits. All arterial blood gas analysis parameters were maintained within normal levels after extubation. Hypercapnia is associated with an increase in cerebral blood volume and CBF. Since the rapid correction of hypercapnia can provoke reduced cerebral perfusion and subsequent seizures, our lung transplantation team discussed this issue preoperatively. Hypercapnia causes vasodilation of the cerebral vessels when the autoregulation pathways of cerebral perfusion are intact. There are physiologic limits on the CBF reflex in patients with hypercapnia . However, the application of CPB during lung transplant can evoke abrupt changes in PaCO2 and pH levels, as shown in Fig. 1. Such changes can be too intense for patients with profound hypercapnia to maintain cerebral autoregulation. Those changes can be aggravated by hypothermia due to impaired cerebral autoregulation [3,4]. Our case suggests that physicians should be aware of changes in CBF during CPB while performing lung transplantation, especially in patients with chronic hypercapnic respiratory failure. If the level of hypercapnia is severe, the patient will require meticulous CPB and perioperative management, such as maintenance of adequate mean blood pressure and PaCO2 levels, to maintain sufficient cerebral perfusion. Compared to alpha-stat, pH-stat (which aims for a PaCO2 of 40 mm Hg and a pH of 7.40 at the patient’s actual temperature) leads to higher PaCO2 (respiratory acidosis) and increased CBF [5,6]. Traditionally, alpha-and pH-stat describe how we interpret arterial blood gas analyses and respond to the natural alkaline shift of blood pH in low temperatures. However, there was no difference between normothermic and hypothermic patients when cerebral vasoreactivity to CO2 during CPB was compared . 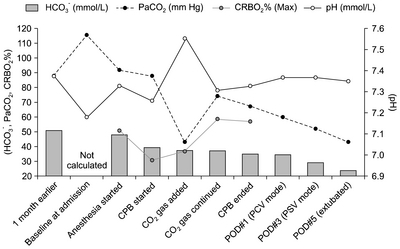 Our experience demonstrates that CO2 gas supplementation during normothermic CPB on the basis of pH-stat management could achieve successful brain protection in patients with severe hypercapnia. We also took great care to prevent alkalosis postoperatively, but the benefits of such efforts are uncertain. To our knowledge, this is the first report describing the successful application of the pH-stat strategy to maintain adequate cerebral perfusion in a patient with profound hypercapnia who underwent lung transplantation. Fig. 1. Changes in blood gas parameters after CPB. CPB, cardiopulmonary bypass; POD, postoperative day; HCO3−, bicarbonate; PaCO2, partial pressure of carbon dioxide; CO2, carbon dioxide; CRBO2%, cerebral O2 saturation; PCV, pressure-controlled ventilation; PSV, pressure-support ventilation. Brian, JE (1998). Carbon dioxide and the cerebral circulation. Anesthesiology. 88, 1365-86. Waseda, K, Tanimoto, Y, and Ichiba, S (2011). Successful extracorporeal life support for life-threatening hypercapnia with bronchiolitis obliterans after allogeneic hematopoietic stem cell transplantation. Acta Med Okayama. 65, 403-6. Pollock, JM, Deibler, AR, and Whitlow, CT (2009). Hypercapnia-induced cerebral hyperperfusion: an underrecognized clinical entity. AJNR Am J Neuroradiol. 30, 378-85. Prough, DS, Rogers, AT, Stump, DA, Mills, SA, Gravlee, GP, and Taylor, C (1990). Hypercarbia depresses cerebral oxygen consumption during cardiopulmonary bypass. Stroke. 21, 1162-6. Kiziltan, HT, Baltali, M, and Bilen, A (2003). Comparison of alpha-stat and pH-stat cardiopulmonary bypass in relation to jugular venous oxygen saturation and cerebral glucose-oxygen utilization. Anesth Analg. 96, 644-50. Kim, WG, Lim, C, Moon, HJ, Won, TH, and Kim, YJ (1998). Comparative analysis of alpha-STAT and pH-STAT strategies during deep hypothermic circulatory arrest in the young pig. Korean J Thorac Cardiovasc Surg. 31, 553-9.